A new Super Rugby season will begin Saturday with two all-South African matches at a time when the frequency of local derbies and the size and format of the southern hemisphere competition are being called in question. New Zealand players and coaches have spoken out this week against a tournament format which throws up regular derby matches which, they say, disadvantage teams in the strongest geographical conferences. The 15-team format of the competition is also in contention with South Africa pushing for expansion and moves underway to extend the tournament beyond its current borders in Australia, New Zealand and South Africa. All of these moves come while evidence seems to show fan support for the championships is ebbing. 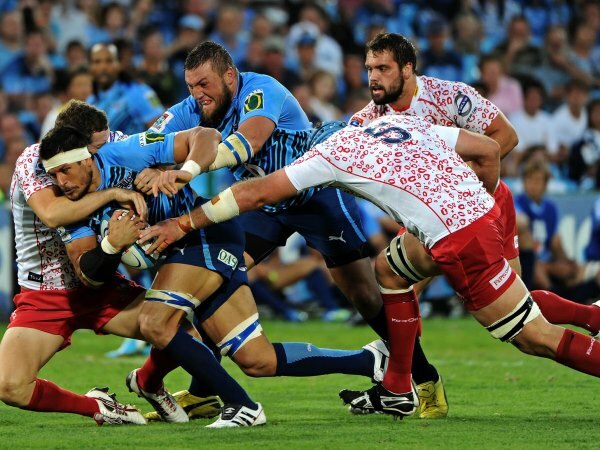 The 2014 tournament begins Saturday with matches between the Bloemfontein-based Cheetahs and Johannesburg-based Lions - the latter returning to the competition after a year's absence - and between the Durban-based Sharks and Pretoria-based Bulls. The first full round takes place a week later when six of seven matches are derby contests between Australian, New Zealand and South African teams. Those matches are seen to have extra appeal to fans but players say they can be too physically taxing and coaches say they favor teams in weaker conferences, who receive more regular season games against softer opposition. The New Zealand conference, in particular, is seen as being strong across the board whereas the Australian conference contains the Western Force and Melbourne Rebels who are seldom title contenders. The first match between New Zealand teams, for example, will pit the two-time defending champion Chiefs against the seven-time champion Crusaders in a match which could involve more than a dozen past or present All Blacks. "I hate playing New Zealand teams twice," Hurricanes and All Blacks winger Cory Jane said this week. "Everyone knows each other, and everyone's out there to beat each other and get those bragging rights. That's hard." New Zealand Rugby Union chief executive Steve Tew said his organization was aware of feedback from players and coaches against derby matches and that would be considered if the format of the tournament is changed when its current broadcast deal ends next year. Tew said the three members of SANZAR, the southern hemisphere body which runs Super Rugby, were working toward agreement on what the tournament might look like after 2015 and evidence from this season's competition might influence their thinking. "We're closer but not close enough to give you a definitive position," Tew said. "Will it look like the current competition? It's still too early to say. "Our view is there's room for change and improvement and we're just working our way through that." Tew said the fan appeal and toll on players from derby matches would be considered. "We've had a pretty consistent message from the players," he said. "Not surprisingly the fans love them. "Some analysis the teams have done show we've probably migrated some of the fans away from other games and into those. We haven't actually increased the number of people watching - just moved their chairs. That's a bit of an issue." Tew said a new-look Super Rugby competition might include a sixth team from South Africa and consideration was being given to admitting teams from Argentina, Japan or the Pacific Islands. "In the end there will have to be compromise," he said. "We would like the new competition to be better than the current one, otherwise there's no point in doing it. "We're really conscious of not asking our players to do more than we're already asking and preferably a bit less. There are pressure points and the home derbies is one of them." Fan support for this year's tournament may color any future changes to its format. While crowd numbers are still generally strong in South Africa, they have waned in both New Zealand and Australia. A season which runs from February to August and which breaks in June for test matches, is seen by some to tax fans' levels of interest. The quality of matches and the strengths of each regional conference this season may determine if and where expansion takes place.